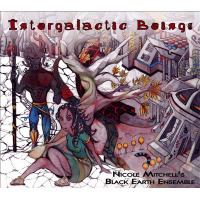 Intergalactic Beings forms the second chapter in flutist Nicole Mitchell's science fiction derived discographical strand. Like the first, Xenogenesis Suite (Firehouse 12, 2008), it showcases Mitchell the composer, again drawing her inspiration from the Afrofuturist novels of Octavia Butler, in which survivors of nuclear holocaust are plucked from earth by aliens who believe that interbreeding is the only way to save the humans from themselves. Commissioned by the Chicago Museum of Contemporary Art, the recording documents the premier at the institution in April 2010. Inevitably given the subject matter, this results in another performance rich in mystery and ominous brooding moods. 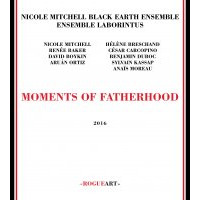 This edition of Mitchell's Black Earth Ensemble retains most of the cast from the previous work, only replacing piano with the guitar of Jeff Parker, and adding the violin of Renee' Baker from her Black Earth Strings. 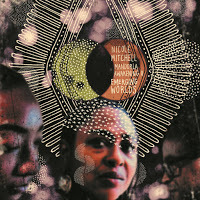 Mitchell employs the ten-piece unit to create dense soundscapes which frame the emotive voice of Mankwe Ndosi. Interlocking riffs, tricky unisons and ostinatos organically develop into ambient improv type structures in a largely continuous program in which atmospheric episodes alternate with more driving solo laden passages. Some of the settings recall another Afrofuturist, Sun Ra, especially the eastern sounding marches for flute and horns over clattering percussion on "Cycle of Metamorphosis." In spite of the emphasis on group texture Mitchell still allows room for individual expression, though she herself enjoys no greater prominence than anyone else. Of the instrumentalists, Baker proves one of the key characters, reveling in spots such as the end of the woozy "Fields of Possibility" where her flickering lines fracture into abrasive shards. Parker contributes choppy chording and effects charged distortion to "The Ooli Moves," while on "Negotiating Identity" tenor saxophonist David Boykin manufactures excitement as he shifts from short urgent phrases to skewed overblowing. Even though Ndosi is tasked with conveying both the human emotions and alien utterance, her voice dominates less than on Xenogenesis Suite. Her otherworldly vocals encompass not only a litany of glottal stops, trills, grunts, squeals and gurgles, but also elements of text in a mode partway between speech and song. 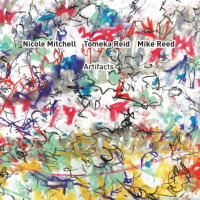 The beautiful melody for voice and Tomeka Reid's cello which closes Resisting "Entanglement" offers some resolution to the journey and transitions into the locomotive "The Inevitables" which features a sparkling flute solo and a swirling tutti followed by an intense percussion section (more shades of Ra) before finishing to enthusiastic applause. A slightly murky recording clouds detail at times, and there are occasional interludes such as the percussive rustling on "Dripping Matter" that translate less well to disc, resulting in a set that might exert most appeal upon existing fans rather than new converts. Track Listing: Phases of Subduction; Cycle of Metamorphosis; The Ooli Moves; Dripping Matter; Negotiating Identity; Web of Hope; Fields of Possibility; Resisting Entanglement; The Inevitables. 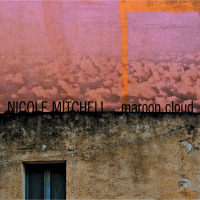 Personnel: Nicole Mitchell: flute, composition; Mankwe Ndosi: vocals; David Boykin: tenor saxophone, bass clarinet; David Young: trumpet, sraliai horn; Renee Baker: violin; Tomeka Reid: cello; Jeff Parker: electric guitar; Joshua Abrams: bass; Avreeayl Ra: percussion; Marcus Evans: drum set.